Dash – The Smart Phone Car Stereo | OhGizmo! I’m almost certain I’ve seen car stereos that cradle your iPhone before, so maybe one of our readers can set me straight. 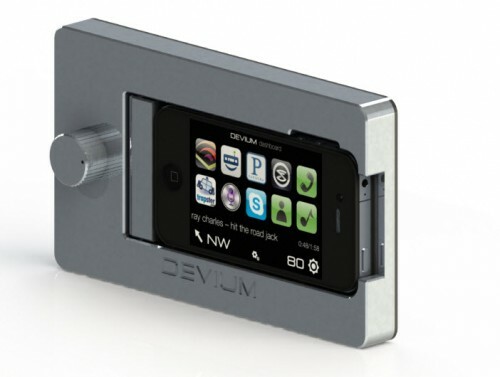 Still, the design of the Devium Dash stereo is intriguing because it’s simple and elegant. The detachable faceplate features one button: a knob for volume. The rest is a space for your smartphone, which when inserted becomes the brains of the unit. While cradled it charges, and you’re free to use any application to listen to the radio or your own tunes. There are several good radio applications on the market, such as TuneIn, so the fact the device itself has no radio features shouldn’t be a problem. The faceplate holds on to the rest of the unit (a full 2-DIN affair) with rare earth magnets, reducing the number of moving components and lowering the risk of mechanical failure. While the first production faceplate is for the iPhone 4 and 4S, there will be versions made for other phones. One problem with this setup is that the iPhone doesn’t display your applications in landscape mode. There is a companion app however, the Devium Dashboard, that does give you access to some of your apps in this way and makes it possible to use your iPhone exactly how you’d expect it to work in this application. Normally $300, you can get yours for $250 on pre-order right now. It’s on Kickstarter, and the company needs $45k to make this happen. They’re at $2,7k right now but have 56 days to go. If they reach their goal, you’ll get your delivery in July of this year.